E&E Construction is a full-service commercial roofing contractor serving residents of Columbus, Cincinnati, Charleston, Parkersburg, Huntington, Lexington, Louisville, Indianapolis, Fort Wayne and the surrounding communities. Our services run the gamut from roof inspection and repair to full-scale replacement. At E&E, we are a company based on the understanding that customer service and high-quality work go hand in hand. We’ve been around for more than a decade, and part of the reason for that is that every job we complete meets or exceeds our customer’s expectations. We aren’t a one-and-done contractor. We build a relationship with every client and stick around afterward for ongoing inspections and maintenance. No matter the type or size of your roof, it will develop problems over time. The experts at E&E Construction are trained to recognize and correct problems with your commercial roof before they grow into huge issues. From tears and punctures to small leaks and failing flashing, we can repair your commercial roof before any major damages occur. Don’t be tempted to DIY your commercial roof’s damages. E&E has the professionally trained and nationally certified technicians, top-quality materials, appropriate tools, and cutting-edge solutions to fix your roof quickly and properly. E&E Construction installs a wide range of roof systems, including, but not limited to, metal, TPO, modified bitumen, PVC, EPDM (rubber), and built-up (BUR). 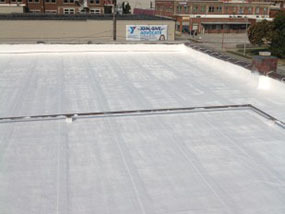 We have more than 10 years of proven success replacing commercial roofs in and around Parkersburg, OH, that are still performing wonderfully. At E&E, we invest in your commercial roof. Because we plan to be around for a long time, we make sure every roof we replace and install is done correctly, designed to last for decades with little maintenance. Coatings expand and contract as temperatures fluctuate, reducing stress on the roof. Coatings are extremely durable, withstanding hurricane-force winds, foot traffic, hail storms, and even fire. Coatings are waterproof – no seams means less opportunity for water penetration. Coatings are often highly reflective, dropping A/C bills by up to 30% or more. 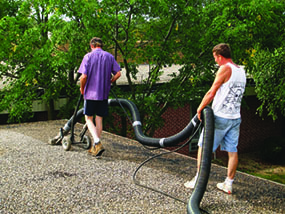 The technicians at E&E are trained to inspect and evaluate your commercial roof for any current or potential problems. To the untrained eye, a roof may look fine, but our experts are primed to notice seemingly insignificant problems – hairline cracks, worn material, etc. Industry standards recommend having a professional roof inspection at least twice a year – spring and fall. We offer customizable maintenance plans for all our commercial roofing clients. Your plan is tailored to your needs – from the frequency to the included services. At E&E, there is a plan for every budget. Our maintenance plans are designed to keep your roof healthy and efficient for as long as possible. Proper maintenance and regular cleaning can add years and even decades to the service life of your roof – not to mention it can save money be delaying and reducing repair and replacement costs. Call us today at (740) 331-0695 for roof maintenance you can count on. If you’ve ever had to deal with insurance in addition to trying to get your commercial roof repaired, then you’ll be glad to know that at E&E Construction, we can help you with your roofing insurance claim. Don’t add to your headache – let E&E go to bat for you. We will make sure you get everything you deserve, providing professional inspections and estimates and communicating with the insurance company on your behalf to make sure your claim is accepted. Didn’t see what you were looking for? E&E is a full-service commercial roofing contractor. If it has to do with your commercial roof, we can probably take care of it – call today for more information – (740) 331-0695.